Last night at Walter Johnson High School there was a joint meeting with the Montgomery County planning department and the schools to discuss planning and the schools issues. 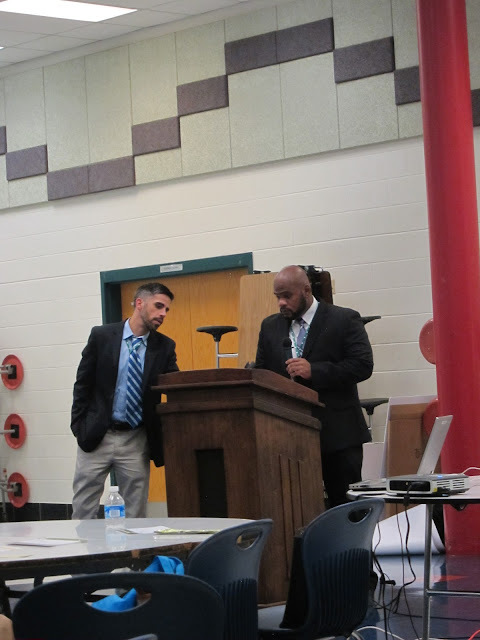 They unfortunately didn't come with any solutions to the crowding in our schools, but they did provide useful information about how they do capacity planning for schools and what the current state of the Walter Johnson cluster is. The first presentation about the schools came from Bruce Crispell, the directory of the Long-range Planning division of MCPS. 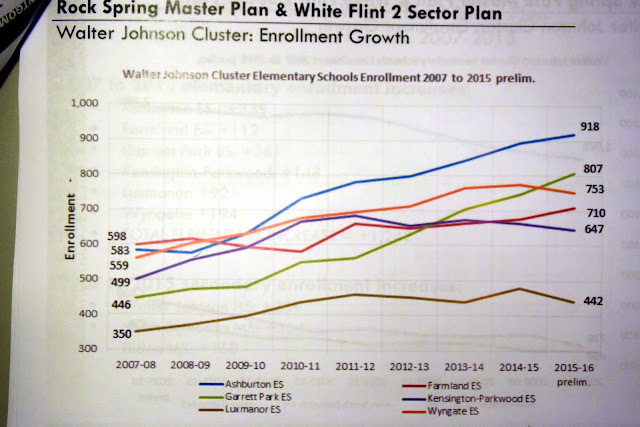 He showed slides on the trends in cluster enrollment growth, current plans for adding capacity to existing schools, and cluster enrollment projections for the next five years. This slide shows the elementary school enrollment from 2007 to 2015. Overall there has been significant growth with Ashburton Elementary school the largest (918 students) and still growing. 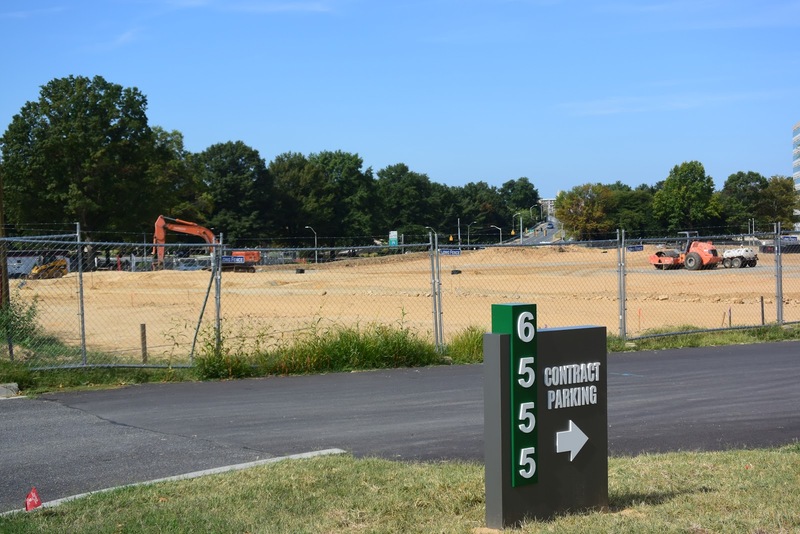 Garret Park is also growing rapidly and is now the second largest elementary school in the cluster with 807 children enrolled. The school system has calculated how many students will be enrolled in the schools for each type of housing unit. 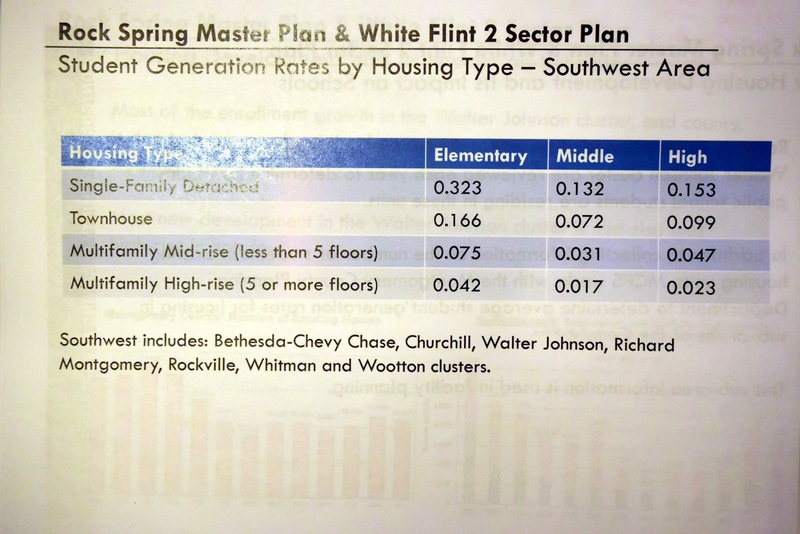 It ranges from a high of 0.323 for single-family detatched houses in elementary school to a low of 0.017 for high-rises (5 or more floors) in Middle school. 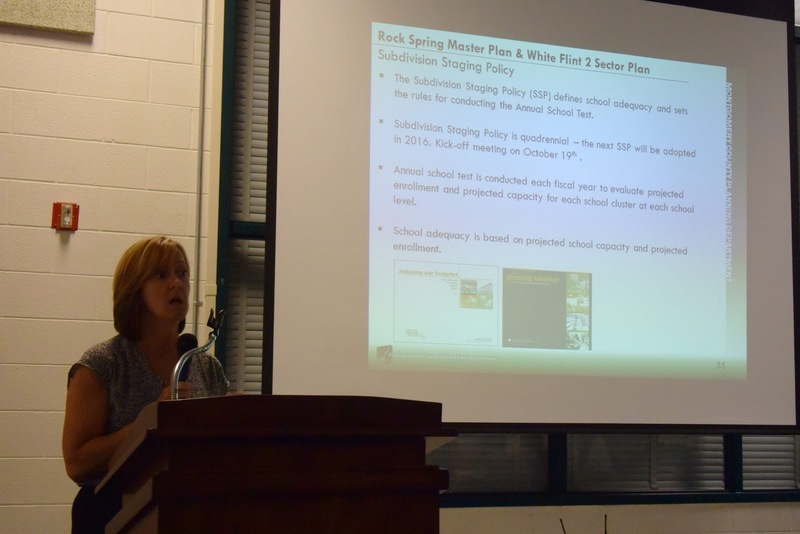 The Subdivision Staging Policy section of the presentation was presented by Pamela Dunn, the acting chief of the functional planning & Policy division in the planning department. This policy is reviewed every four years (next review period starts in October) and is a critical part of the planning process since it defines what it means to have adequate capacity in the schools, when schools are overcrowded enough that developers have to pay into the school system, and when schools are so overcrowded that there should be a development moratorium. She talked about how after 2008 they changed how the calculate the student generation rate of new housing to use actual MCPS student addresses matched to structure type information (Single family detached, single family attached, Mid-rise multifamily, and High-rise multifamily). After the presentation, they had tables set up where people could ask questions about specific parts of the process. The one related to the public schools was the most crowded, but they also had a table for the Rock Spring development, the White Flint 2 development, and the road and school capacity planning (The Subdivision Staging Policy). The public schools table was by far the most popular. This meeting was much more informative than the Rock Spring planning meeting, but, the final result is that they still don't have a plan for handling the students coming from the high density infill development they are proposing. 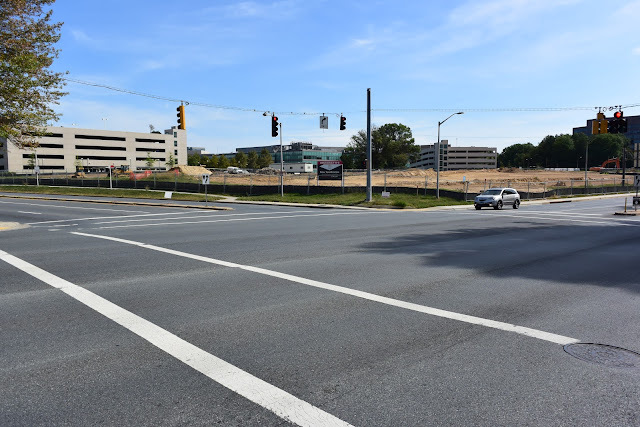 The Montgomery County Planning board recently released a pdf presentation on the state of bicycling in Montgomery County. Part of it talks about BikeShare (starting on page 33). I've had a few questions about bike share, primarily, how much is it costing taxpayers, is anybody using it, and is it worth it? This presentation answers some of those questions. First, some basics. 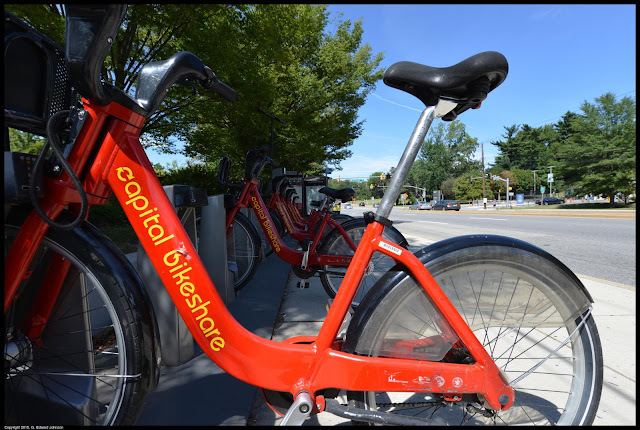 There are 51 bikeshare stations in Montgomery County, MD in Tacoma Park, Bethesda, Silver Spring, Friendship Heights, Rockville, and Shady Grove. The first 14 opened in September of 2013. 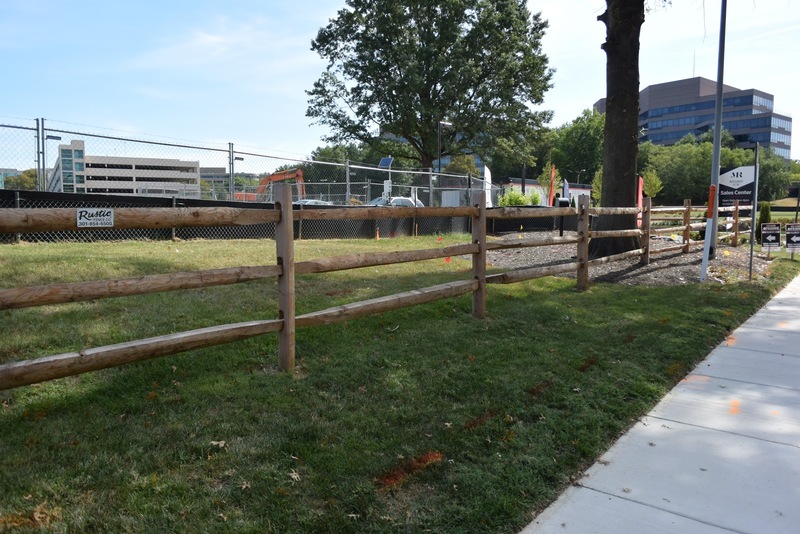 Bikeshare got its initial funding from a variety of sources, a $1 million state transportation grant, a $250,000 state bond and a $200,000 commitment from the Chevy Chase Land Company, a private developer, and $140,000 in developer payments to Montgomery County (see this article). Montgomery County spent 3.78 million dollars in 2014 (the first full year of operation) and has budgeted 1.6 million dollars in 2016 for Bikeshare. 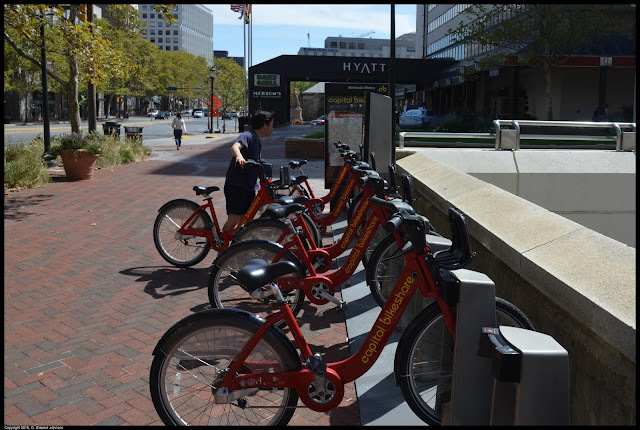 A significant portion of the 2014 cost of bikeshare were one time costs associated with buying docking stations. 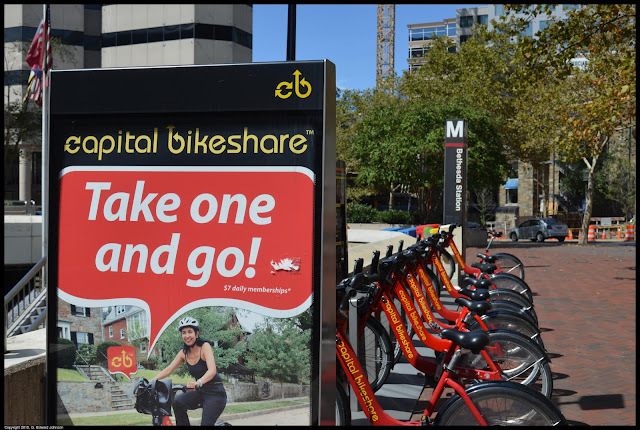 Most bikeshare stations are located on public property so there are no dollar costs associated with the land the stations are on, but there are opportunity costs. 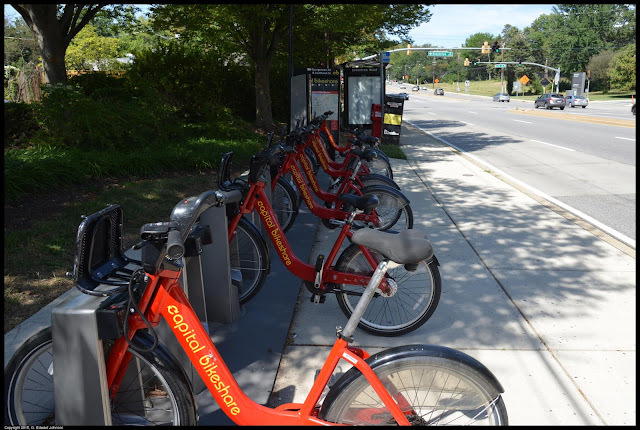 2014 was the first full year of operation for BikeShare in Montgomery county. September was the month with the most trips and it had under 6,000 trips for the entire month. That works out to under 200 trips per day across the whole county bikeshare network in the busiest month. The least busy month was January which saw around 1,000 trips, or about 33 trips a day (less than one per bikeshare station on average). The bikeshare station at Bethesda Metro. This is the most used station in the network. More trips originate here than any other station. The busiest station in the network was the one at Bethesda Metro, with 11.3 trips originating there per day on average. 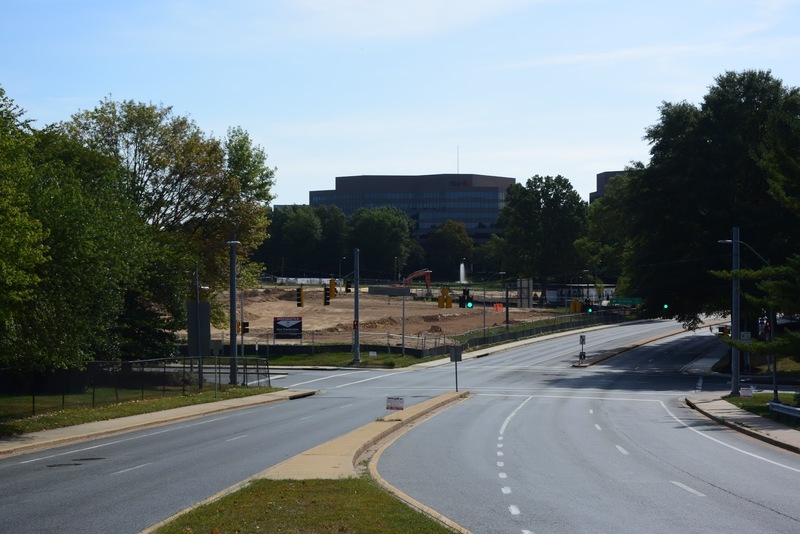 Friendship heights metro came in a distant second with 6.5 trips a day originating there. So to summarize. The most popular station sees less than 12 trips a day starting there. Each trip in the system is subsidized by about $39 in county funds, and we lose the use of the land the stations are on. Is it worth it? Or are there other transportation initiatives that the county that would make better use of the millions of dollars the county spends on Bikeshare? 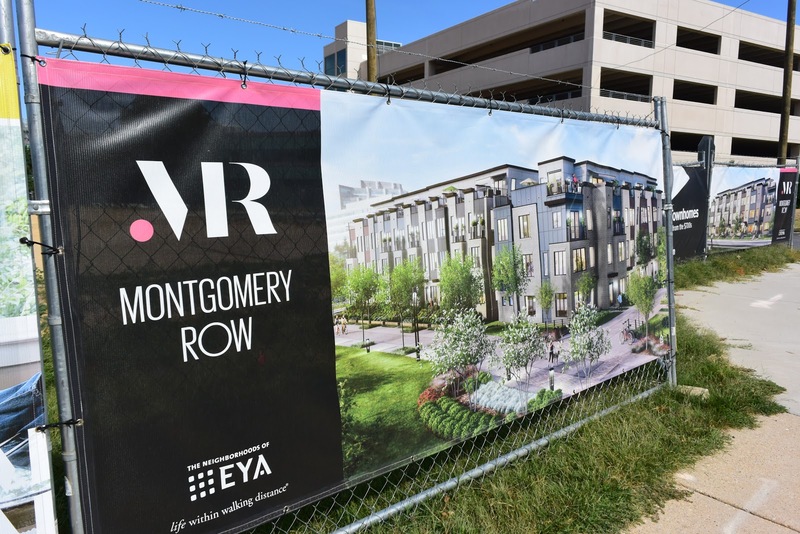 Montgomery Row is the name of a new townhouse development in the Rock Spring area of Bethesda that promises "New Townhomes with rooftop terraces from the $700s". The development will consist of 168 townhouses. Site work is just starting with the site being leveled in preperation for building. These townhouses will be in the Ashburton ES/North Bethesda MS/Walter Johnson HS school districts. On Fernwood Road, coming over the I-270 bridge. I went to see the status of the new townhouses in the Rock Spring area of Bethesda when I ran across this very unusual "Forest Retention Area". 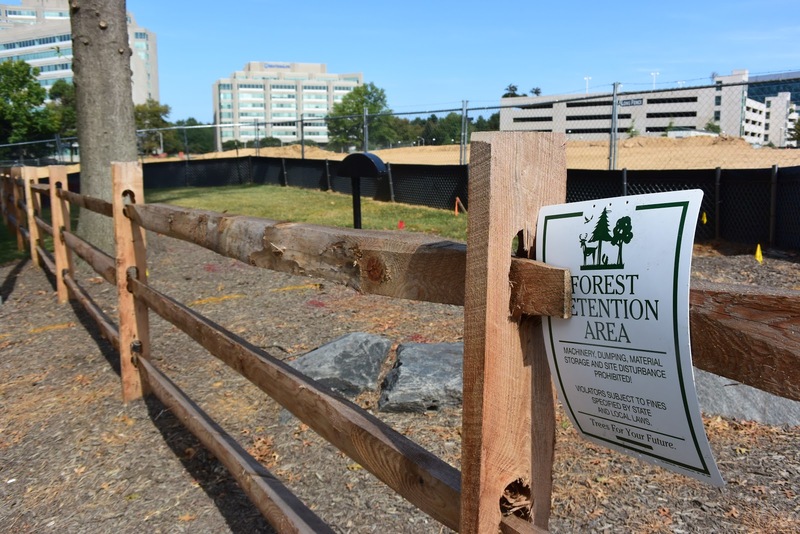 What is unusual about it is not that there is one near construction, but that there is only a single tree in this "forest". 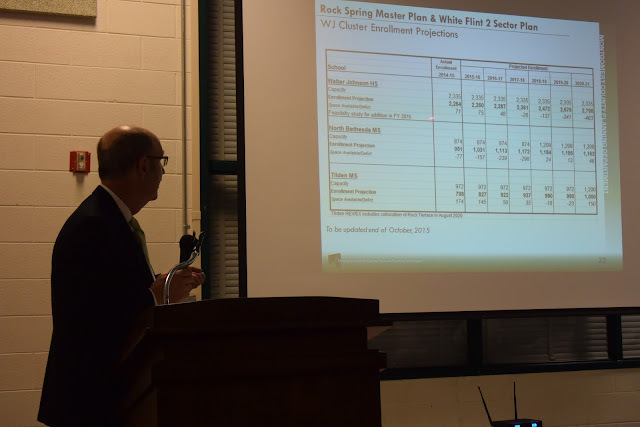 Last night the Montgomery County planning department held the kickoff meeting for updating the Rock Spring master plan. 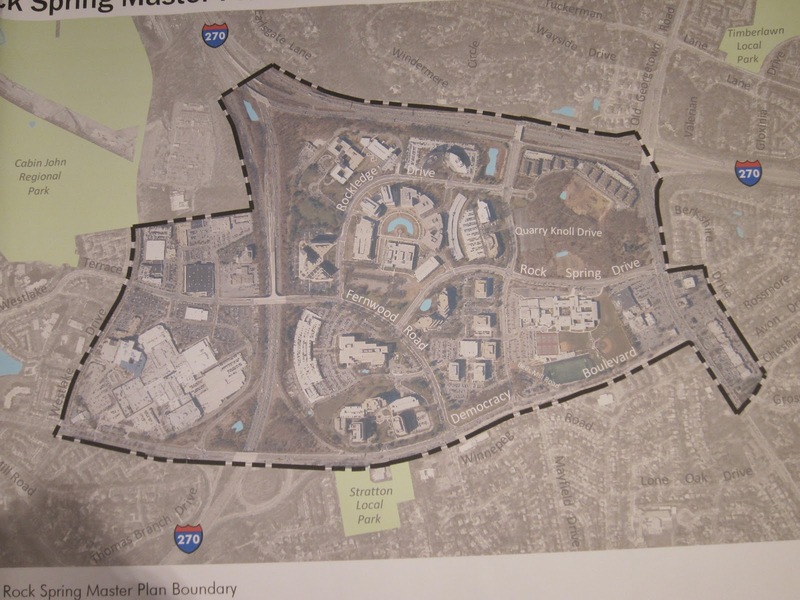 This is the area bounded by Democracy Blvd on the south, I-270 on the north, the I-270 spur on the west and Old Georgetown Road on the east. (It also includes the Montgomery Mall area and Wildwood shopping center.) 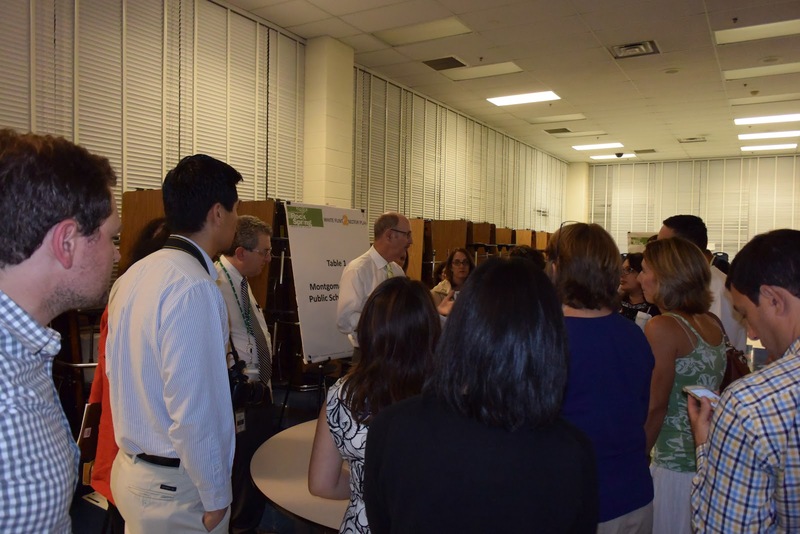 The meeting was held at Walter Johnson High school. The first part of the meeting was a powerpoint presentation by Don Zeigler (at the podium in the above picture) giving the current state of the rock spring area that summarized what companies and jobs were there, where the people who work there live, the makeup of the neighboring area, the challenges the area faces, then going into some potential land uses. High office vacancy rate (18.7%) with county trends suggesting the vacancy rate will increase. 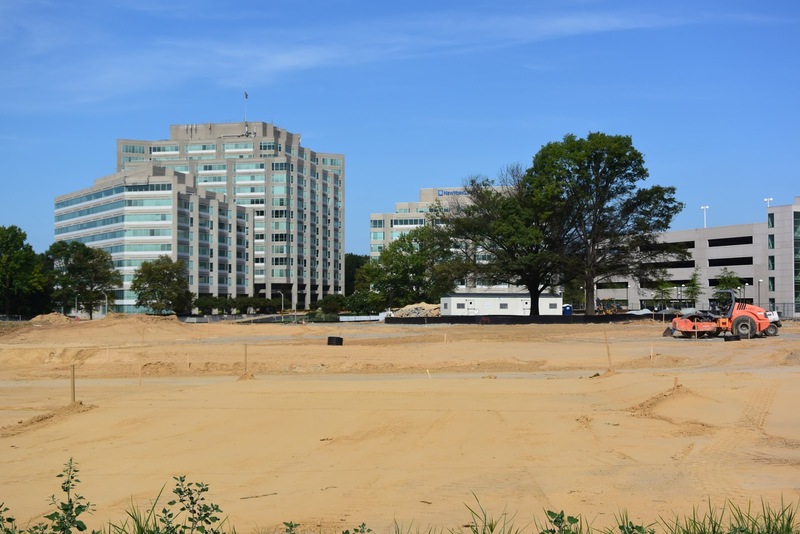 Single-use, auto-oriented office parks are losing their appeal. The powerpoint should be posted on the Montgomery Planning Rock Spring website in the next few days. The next segment of the meeting was a question and answer session. 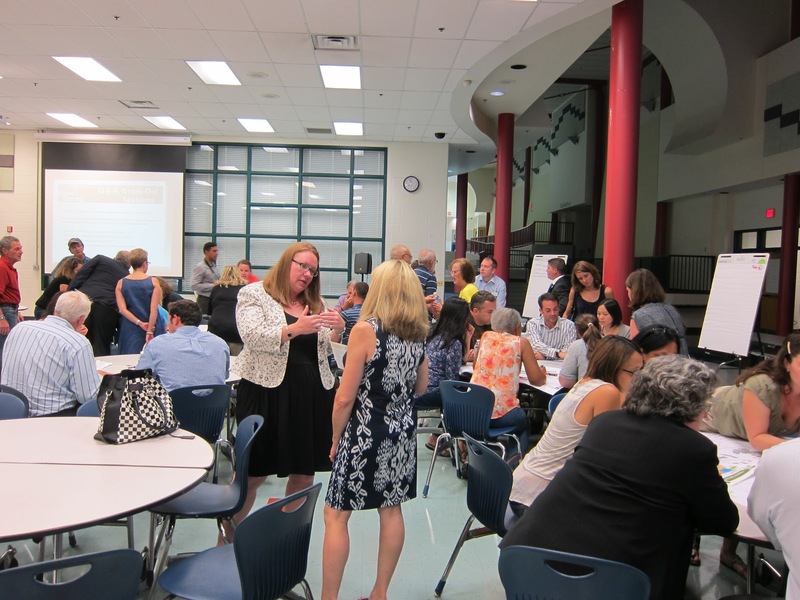 This session was dominated by residents concerned about school overcrowding that would be made worse by additional residential development in the Walter Johnson cluster. Glen Kreger (Area 2 Chief) said that Education is so important that there will be a special meeting just for that on September 17th. However, it apparently wasn't important enough to bring anyone with them that could answer any questions about the schools. The third portion of the night was dedicated to small group breakouts where tables of 10 to 12 people got together to discuss what they like about the Rock Spring area, What they don't like about the area, and what they would like to see in that area. Following the breakouts, each group reported to the whole room what they talked about. Every group put schools as the number one issue, other major themes were traffic/transit, retail and grocery stores, as well as recreation opportunities and the environment. Upcoming meetings related to this project are the Joint White Flint II and Rock Spring Master Plans School Meeting at WJ on September 17th, the Bicycle Master Plan Meeting at WJ on October 6th, and the Rock Spring Master Plan Scope of Work on October 8th at the Montgomery County Planning Board.